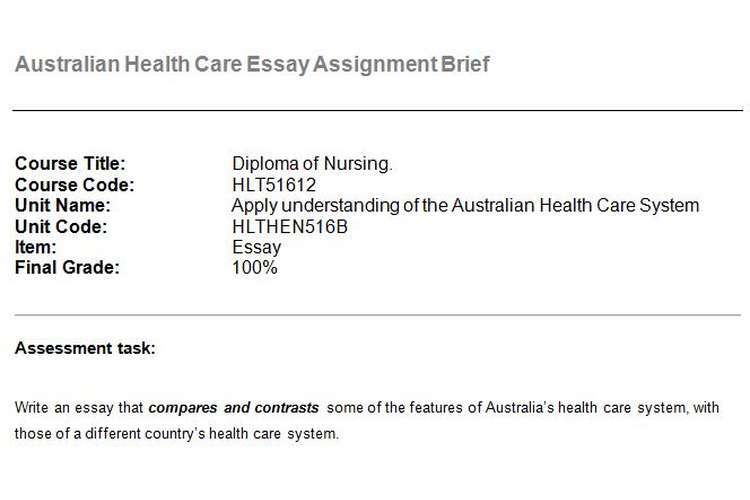 Write an essay that compares and contrasts some of the features of Australia’s health care system, with those of a different country’s health care system. Discuss the overall structure of the Australian health care system compared to the other country’s health care system. Examine the funding models for both health care systems; reviewing the roles and contributions of the government, private insurance companies and the individual. Compare and contrast the health outcomes of each health care system to global averages. Identify health care policies and the social impact of health care delivery to Indigenous populations or minorities groups within each country. Discuss the strengths and weaknesses of both health care systems. Outline one primary health care, a preventative health care program or a health promotion program that highlights the Australian health care system. Introduction: introduction the topics or issues in the essay and identification of the direction and style of the essay. Body: a paragraph for each topic or idea identified, presented in a logical sequence. Information, ideas and material must be referenced (see below). Conclusion: a brief summary of the topics discussed, the issues identified and any conclusions, judgements or recommendations based on the information discussed in the body. The conclusion does not include new information or direct quotes. The essay word limit is between 1500 - 2000 words, including in-text references and excluding the reference page. No grading occurs beyond the allocated word limit. All material, information and ideas presented in the APA referencing. In-text references and a separate page reference list are required. A minimum of 15 references. All material, information and ideas presented in the journal articles, academic textbooks (less than five years since publication) and websites. Suitable and appropriate websites contain a domain such as .edu, .gov, .org or .net. the material by a recognised, and reputable organisation or published author.